After serving this in the tasting room for the past couple of weeks…I have been begged, bribed and pleaded with to post this recipe. It is an absolute must with Pinot Noir. Many of you have even wanted to buy the pâté in the tasting room….sorry, we don’t sell food…it just comes with the wine tasting. A little bit of pâté smeared on a crostini and topped with red onion jam….TO. DIE. FOR. This is not your Mama’s Liver n’ Onions and the cognac in this recipe is a must, don’t even think about leaving it out. While many of you might be squeamish about eating pâté, those of you that aren’t will absolutely love it. In a small saucepan sprinkle gelatine over chicken stock and heat slowly and stir until dissolved, about 2 minutes. Set aside and let cool. In a medium saucepan, combine chicken livers, onion, garlic, bay leaf and thyme and 1/2 teaspoon salt. Add water and bring to a simmer. Cover and reduce the heat to low and cook, stirring occasionally, until the liver is barely pink inside, about 3 minutes. Remove from the heat and let stand covered for about 5 minutes. Remove the bay leaf and using a slotted spoon, transfer the livers, onion, garlic and chicken stock-gelatine mixture to a food processor; process until smooth. With the machine on add the butter, 2 Tablespoons at a time until incorporated. Add the cognac and season with salt and pepper to taste. Process again until smooth. Scrape the pâté into several ramekins. Press a piece of plastic directly onto the surface of the pâté and refrigerate until firm. Serve chilled. Run a knife around pâté edges and turn over to remove from ramekin. Melt butter and olive oil together in a large nonstick saute pan over medium heat. Add the onions and saute over low heat until slightly cooked. Add sugars, salt, pepper and thyme. Stir to combine. Continue to cook onions over low heat for 15 minutes, stirring often to make sure sugars do not burn. Add vinegar, stir and simmer-stirring periodically for an additional 30 minutes. Cool completely and chill in the refrigerator for 2 hours. The jam is also amazing on burgers. Oh. My. Word. I haven’t had pate’ in FOREVER. This looks scrumptious! Thank you! I had this in the tasting room and it is fantastic! Perfect pairing with Pinot Noir. I was one of those who begged for the recipe! Thank you! Oh my lawd, this looks so divine, and so classy. And I’m sure this is entirely fat free, right? YUM! I’ve always wondered how this was made, and one fine day, perhaps with some nice home-made whole-wheat toast points, I’ll have to whup some of this up. MMM! I used to buy pate at Trader Joe’s till they stopped carrying it. Talk about major withdrawal. You can be sure I’ll be making this on the weekend. Thanks so very much! Mmmmmmm! 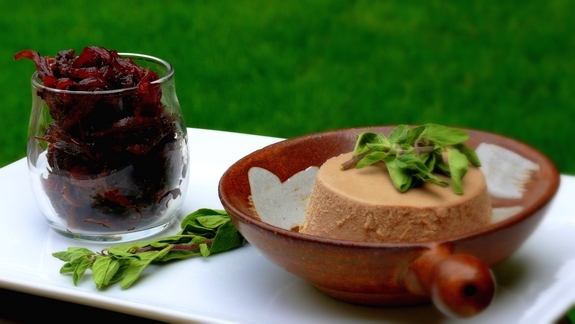 What a wonderful pate … the jam is the perfect complement too! What a pairing with your wonderful pinot! I happily begged for the recipe(s) when I was in the tasting room a few days ago. I just checked in with the blog intending to beg some more only to find that my wish had already been granted. I love this blog and I love the wine. Thank you so much for both. Noble Pig rocks! This is absolutely amazing! I can’t wait to make it!! While this looks amazing….it tastes even better!!! Wonderful recipe, thank you!